I wrote briefly about Anak Nakal a couple of times (here and here) before this year's Kentucky Derby Presented by Yum! Brands (gr. I). I liked the 3-year-old son of Victory Gallop because of his looks and because of his neat breeding pattern. He's got several lines of one of racing's greatest legends, Dr. Fager. Those lines come through Fappiano twice, including once through his son Quiet American (SRO), who is futher inbred to Dr. Fager. (We just looked at Quiet American last week in this space.) As an aside... many Thoroughbred pedigree analysts claim that Fappiano was much more like his broodmare sire (Dr. Fager) than like his own sire (Mr. Prospector). Anak Nakal descends from Thoroughbred female family 1-t, the same female line as the American foundation sire Glencoe. It's also the same family (although a different branch) as 1967 Kentucky Derby winner Proud Clarion. A closer relation from this family is Bon Mot (FR), winner of the 1966 Prix de l'Arc de Triomphe. 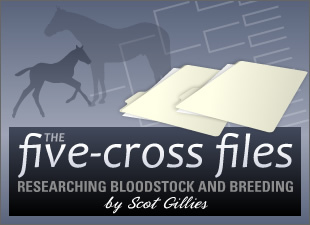 As I looked through the five-cross pedigrees of the best runners from family 1-t, a common pattern was evident: Djebel (FR) (pedigree) was represented disproportionately. Djebel is the sire of Proud Clarion's broodmare sire. He's the broodmare sire of Bon Mot's dam (and, in fact, Bon Mot is inbred 5 x 5 to Djebel's grandsire, Ksar). Anak Nakal, though, doesn't have any Djebel blood (no trace at all of Djebel's female family within the last 9 generations, and only a 7 x 7 cross to Djebel's sire, Tourbillon (FR)).